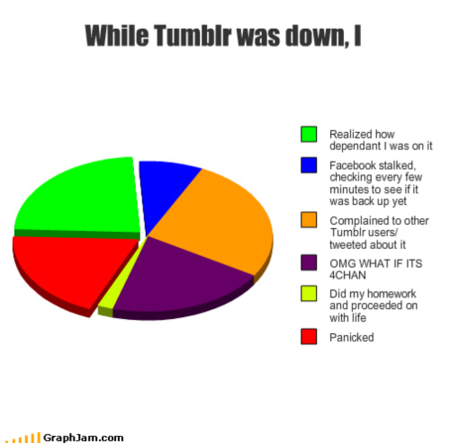 Hipster blogging platform Tumblr is back up and running now after an outage of roughly 24 hours. That’s a long time in blog hosting world and the site got a lot of flak for going under and taking all its blogs with it for most of yesterday. They say it was just “growing pains” due to their large number of members. At least it doesn’t seem to have been an attack from 4chan this time.. Thank god we can look at Unhappy Hipsters, Kim Jong Il Looking At Things and ThisIsWhyYou’reFat once again. Related: Why is Tumblr cool?